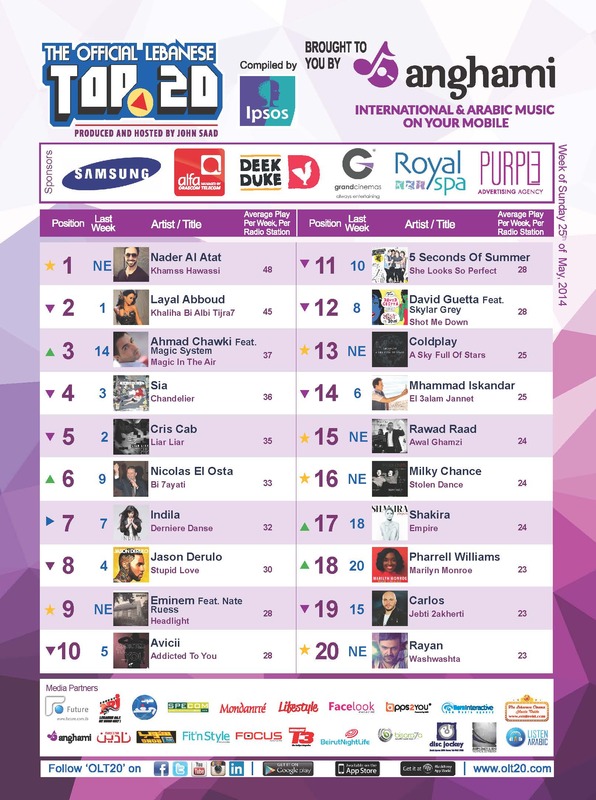 For the 1st time ever on The Official Lebanese Top 20, we’re witnessing the rise of the local armada of Lebanese singers with a 5th Artist in a row hitting the Top of the Chart! Following Nancy Ajram (2 weeks), Naji Osta (1 week), Joe Ashkar (1 week), and Layal Abboud (2 weeks), it’s now the turn of Nader El Atat to rise to Number 1 with “Khamss Hawassi”. Currently about to start a US Tour with Ragheb Alama, Nader will be dropping by for an interview as soon as he comes back.. “Khamss Hawassi” is his 4th Top 3 in a row following “Bawast Tyabik” (2011), “Nader” (2013), & “Same3ni Sawtak” (2014). From the New Entries of the week, we have “A Sky Full Of Stars” at Number 13 from British Alternative Rock band Coldplay, “Awal Ghamzi” at Number 15 from Lebanese singer Rawad Raad, “Stolen Chance” at Number 16 a re-entry from German duo Milky Chance, and “Washwashta” at Number 20 a song by Lebanese singer Ryan. On OLT20 this week we have 7 Local and Regional artists, and 13 Occidental ones! Note that you can check out the latest videos from your favorite singers on the TV show “Hits N Bits / OLT20” on Future TV every Friday evening around 11:00pm, and Sunday evening at around 7pm for the re-run.